make for happy, healthy smiles! At McCulloch-Wilson Dental, we’re passionate about making your visits to our office comfortable and pleasant; we think one of the best ways to achieve this goal is by helping you prevent the need for invasive, time-consuming dental procedures. We keep your success rate high by giving you the information you need on oral-systemic health, which habits and genetic factors increase and decrease your risk of developing infection and disease, and teaching you how to conduct stellar hygiene routines. We know patients don’t particularly love when we ask about their oral hygiene habits, but please trust us when we say it’s not an interrogation—we want to know where you’re starting from and help you improve when it’s necessary because we care about your health and want you to be confident in your smile. We’ve found that even the most diligent brushers and flossers could use some pointers when it comes to products and techniques, so don’t feel bad if your regimen could use some work. The purpose of strong oral hygiene routines goes beyond fresh breath and clean teeth. A solid routine helps you remove plaque before it hardens and becomes tartar, which can only be removed by dental professionals. You’re also decreasing the amount of bacteria present in your mouth, which helps protect the rest of your body. With the simple acts of flossing and brushing daily, you’re strengthening your defense against oral and systemic infections, increasing confidence in your smile, and making your dental visits a breeze. We think that’s a win-win-win! When you practice great oral hygiene and disrupt the bacteria in your mouth, you’re able to prevent the demineralization of your teeth that results in cavities, as well as fight gum disease. Gum disease, also known as gingivitis or periodontitis in its advanced form, is the leading cause of adult tooth loss. As if that weren’t bad enough, gum disease doesn’t stop at taking your teeth. The bacteria associated with gum disease is linked to other systemic illnesses like diabetes, heart disease, and Alzheimer’s. This is why we inquire about your oral hygiene routines and things like your diet, because the foods and beverages you consume can also create, feed, or calm inflammation, the link between these illnesses and many more. We also strongly suggest cutting habits like tobacco smoking, because not only does it double the likelihood of you having gum disease, it makes you six times more likely to develop oral cancer. Another thing we feel is important for our patients to know is that the bacteria associated with gum disease and subsequently heart disease, diabetes, stroke, and more, are contagious. That means even if you don’t have them, your partner can give them to you with a kiss or use of your toothbrush (all the more reason to keep those separate, right?). This stresses the importance of mothers-to-be taking good care of their mouths, because gum disease has been linked to premature birth and lower birth weight. We want to help your entire family fight and prevent gum disease, so keep up on the oral hygiene routines and your visits to our office! An important part of our thorough examination process includes oral cancer screenings. In our office, we implement OralID™, an optical fluorescence tool that, when used with our eyewear, illuminates cell abnormalities. Unfortunately, oral cancer is often found in later stages when it’s visible to the naked eye, which accounts for a low survival rate. 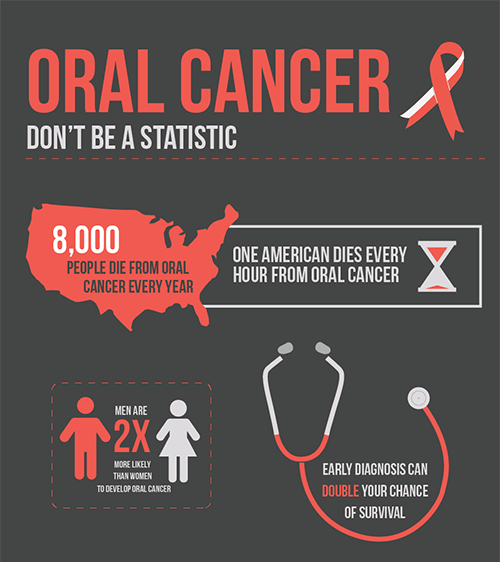 In fact, one person per hour dies of oral cancer in the United States. General oral cancer screenings are painless; we use OralID to help us see things that might otherwise go undetected, and gently palpate your throat to ensure there is no swelling of your lymph nodes. Early diagnosis is critical in the fight against oral cancer—the 5-year survival rate drops from 86% to 39% when oral cancer is caught in later stages. It’s important to know what increases your risk of oral cancer, but also to note that the risk factors aren’t applicable for 25% of those diagnosed with oral cancer. While tobacco may be an obvious culprit, frequent alcohol consumption is one that surprises more people. However, both of these risk factors are actually being surpassed by human papillomavirus (HPV). Your team at McCulloch-Wilson Dental screens for oral cancer during every examination. For the peace of mind you and your family deserve, see us for your regular checkups. With prevention being one of the focuses of our practice, it should come as no surprise that we’d strongly advise Katy families wear mouthguards if they play contact sports. Up to 39% of dental emergencies are sports-related, and the number of teeth knocked out in the United States while playing contact sports is around five million per year! The sports in which dental injuries seem the most prevalent include basketball and baseball, which is likely due to the infrequent use of mouthguards in both activities. While most sporting goods stores offer stock and boil-and-bite mouthguards, they do not get our highest recommendation. The materials used to make them aren’t as strong, and because they’re not made to fit your unique mouth, they can be uncomfortable. For the highest level of protection, comfort, and durability, we recommend custom-fitted mouthguards made by your dental team at McCulloch-Wilson Dental. We also provide comfortable nightguards to protect your teeth and jaws from nighttime grinding and bruxism (jaw clenching). If you experience frequent headaches, earaches, tooth sensitivity, orofacial pain, or any difficulty opening and closing the mouth, including when speaking or eating, it may be due to frequent clenching and grinding. If you don’t notice these habits happening during the day, it could be during your sleep cycle that your upper and lower teeth meet less than gently. A customized nightguard can protect your TMJ (temporomandibular joint) and teeth from excessive wear and inflammation, which can lead to noticeable improvements in facial and head pain during the day! If you knew a way to strengthen your enamel’s defense against cavities, would you give it a try? We’re happy to tell you there is a safe, simple dental procedure that’s been shown to reduce cavities in permanent teeth by as much as 80%! This is especially good news for parents that want to keep their children’s teeth protected as they continue working on their oral hygiene routines. 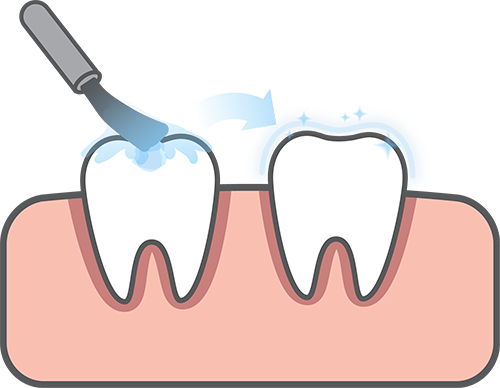 Dental sealants are a clear coating that’s brushed onto the chewing surfaces of your teeth, primarily the molars (teeth in the back of your mouth), then hardened with a light to stay in place for what can be several months or a couple of years. This coating helps protect your teeth from acid erosion, the result of food and beverages meeting bacteria, or brushing too soon after meals—but this doesn’t mean you’ve got a free pass to skip flossing and brushing or to eat all the sweets you crave. 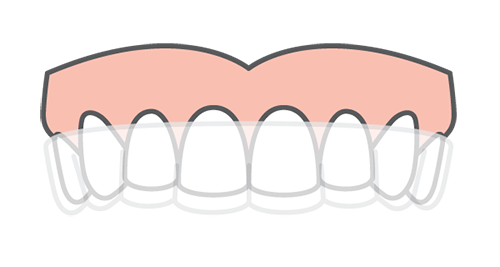 These actions will wear the sealants down quickly and require the application of new sealants—or the filling of cavities if they’ve eroded completely. A person in good health can produce anywhere from 0.75 to 1.5 liters of saliva a day. Saliva is an essential component of oral health, but most people don’t know its composition and how it contributes to their overall health. We’re happy to share our knowledge on the subject and provide bacterial analysis on your saliva to increase your awareness of risk factors for oral and systemic infections and diseases, and how to decrease them. Your saliva is 99.5% water, but also contains enzymes that help break down food and prevent enamel erosion, and epithelial cells, from which DNA can be painlessly extracted for testing. Your DNA can tell you whether you’re carrying pathogens known to cause gum disease and increase your risk of heart disease, stroke, diabetes, and birth complications, as well as whether you were born with gene markers associated with increased inflammation. Additionally, our OralDNA® tests can identify whether you have the high-risk strains of HPV associated with oral cancer. We know there are times patients feel it’s better not to know, because knowledge can cause stress and fear. However, we want you to be aware of your results give you the information you need to boost and protect your health. There are proven ways to reduce inflammation and fight gum disease and the diseases linked to it. We’re here to do our part and give you much-deserved support. Meet Your Oral Health Advocates Today! If you have any questions about our services or are ready to schedule an appointment with your Katy dentists, Dr. Wilson and Dr. McCulloch, McCulloch-Wilson Dental would love to hear from you!